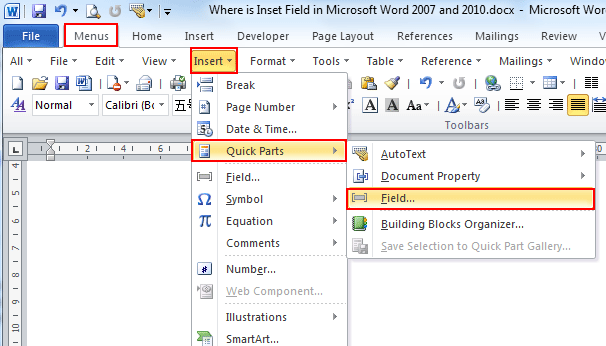 Field is used to insert changeable contents in your document. It will be updated when the documents change. If you know how to insert the field, that will make your work easier. This topic means to point out where the inert field function is in Microsoft Word 2007, 2010, 2013, 2016, 2019 and 365, helping the users who have recently upgraded to the new version of Office with the difficulties in getting used to the previous Word 2003/XP(2002)/2000. Use the familiar Word 2003 style in working with Word 2007, 2010, 2013, 2016, 2019 and 365 if you have Classic Menu for Word installed. Just take Microsoft Word 2010 for example, which is as well as in Word 2007/2013. With Classic Menu for Word 2007/2010/2013/2016/2019 installed, you can click Menus tab to get back the classic style interface. The software Classic Menu for Office is designed for the people who are accustomed to the old interface of Microsoft Office 2003, XP (2002) and 2000. It brings back the classic menus and toolbars to Microsoft Office (includes Word) 2007, 2010, 2013, 2016, 2019 and 365. The classic view helps the people to smoothly upgrade to the latest version of Office, and work with Office 2007/2010/2013/2016 as if it were Office 2003 (and 2002, 2000). Easy to install and use. Supports all languages. Free download!